IN what appears to be the largest single seizure of cocaine in the UK, the authorities have charged nine Turkish men as part of the smuggling probe into more than three tonnes of the drug. 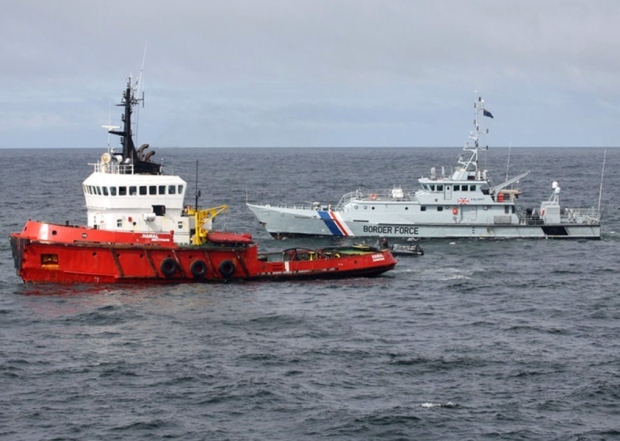 The nine men, aged between 26 and 63, all appeared before Aberdeen Sheriff’s Court yesterday, charged with possession of a controlled drug after an operation last week which saw the tug they crewed, MV Hamal, intercepted by Royal Navy and Border Force vessels. The operation followed a tip off from the French customs after the tug, registered to Marshall Islands company Kiev Shipping and Trading Corporation, and flying a Tanzanian flag, was spotted 100 miles off the Scottish coast heading for Hamburg port. The German port has in recent years become a mirror to Antwerp as a shipping gateway for the introduction of South American cocaine into Europe. French sources believe the drugs could have been loaded onto the vessel in the Canary Islands early in April where it had docked. Officers from the National Crime Agency working in conjunction with Police Scotland and the Royal Navy boarded the boat and brought it ashore to Aberdeen last week. French sources have estimated the seizure at more than two tonnes with a search of the boat continuing for several days. The largest previous UK seizure of cocaine was in May 2011 in Southampton when a 1.2 tonnes load connected to Dutch-moroccan gangster, Samir Bouyakhrichan, later assassinated in Marbella, Spain, was seized from a luxury cruiser. 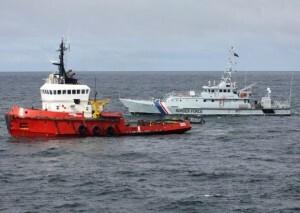 Though searches of the boat are expected to be completed by tomorrow, the load seized in Aberdeen could amount to as much as the total 2.4 tonnes of cocaine seized in the UK for the year 2011/12. Seven men from Istanbul appeared in court yesterday.Mustafa Ceviz, 54, Ibrahim Dag,47, Mumin Sahin, 45, Mahammet Seckin, 26, Umit Colakel, 38, Kayacan Dalgakiran, 63, Emin Ozmen, 50, were remanded in custody along with two men other Turkish men arrested on the boat; Abdulkadir Cirik, 31, from Mersin, and Mustafa Guven,47, from Yozgat. Investigations are continuing into the gang behind the smuggling plot. This seizure comes just 10 days after 2.25 tonnes of cocaine was seized from a yacht off the Martinique, the largest ever by French customs, in an operation which also involved the National Crime Agency. In the past year large scale cocaine and heroin shipments which have been intercepted by the authorities have led to crime gangs in Netherlands, with links to Turkey and Morocco, executing a series of assassinations of significant gang members across the globe in an apparent power struggle.